TheBlueGuerilla: LEAKED: UKIP Getting Over-Confident. 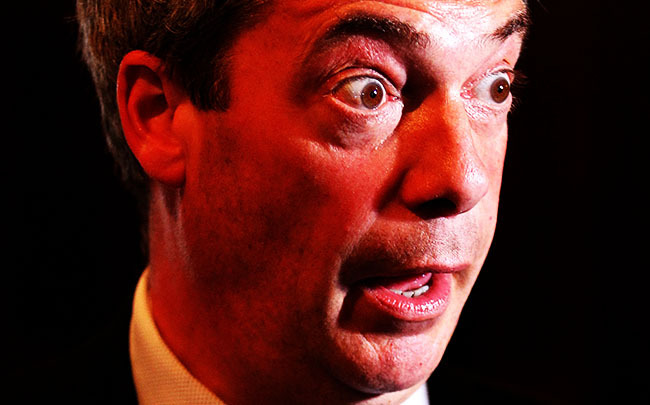 As if Nigel Farage's weekend didn't begin bad enough after his car crash interview on LBC earlier its just got worse. TBG can exclusively and sensationally reveal that Nigel Farage's UKIP are ALREADY inviting members and supporters from the South East to a celebration party, "to celebrate what we anticipate will be some great results in the Local Government and European Elections!" The invites went out earlier this week from their new regional office on Church Street in Basingstoke in Hampshire. Their old regional office in Sussex was the subject of an expenses row. The celebration event includes a Gala Dinner at The Congress Theatre in Eastbourne on the evening of Friday 6th June and a "Meet your newly-elected MEP Lunch" a day later in The Floral Hall of the same theatre. Tickets for the Dinner are a whopping £45 and are being booked at www.ukipse.ticketsource.co.uk. TBG understands that as Nicholas Soames said with William Hague and Henry Smith in Sussex earlier, "UKIP are in for a big surprise!"